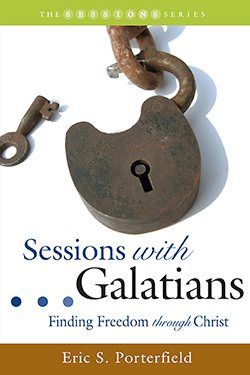 Sessions with Galatians is a ten-lesson study unit designed to provide a compelling study of Paul’s letter to the Galatians. Each session is followed by a thought-provoking resource page of questions that allow for a deeper experience of the scriptural passages. These resource pages can be used by seminar leaders during preparation and group discussion, as well as in individual Bible study. Eric Porterfield takes readers on a journey through Paul’s letter to the churches of Galatia. The letter celebrates Christ’s faithful love for humanity, which evokes the human response of faith and love. Jesus overcomes the barriers that keep human beings separated and creates the freedom of life in Christian community. Jesus frees us from lives of self-focus and frees us for lives of faithful witness, revealing that true freedom comes when we love God and love our neighbors. Eric S. Porterfield is married to the Rev. Alicia Davis Porterfield. They have two children, Davis and Luke. He is a graduate of Duke Divinity School and serves as pastor of the First Baptist Church of Sanford, North Carolina.